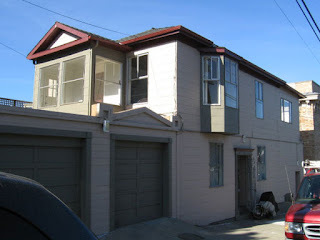 Two months ago, we left the Haight (the Hate) and moved into a new place at the very top of the Potrero Hill neighborhood, a strange confluence of the industrial (Anchor Brewing is down the street), the yuppie and the disadvantaged. Not long after we moved in, I was sitting at a place nearby called the Thinker's Cafe (yeah, they sold me a beverage anyway) and overheard a middle-aged guy with a sweatered little dog and tinted shades approach two cops who were on their break at the next table. "Hey, guys, I'm sorry to bother you, but I live over on 23rd and Missouri? And I was just wondering, those gunshots I hear? Where are they coming from?" The cops pointed toward the projects that are just down the hill from my place. "Oh! Okay, and should I bother calling the police?" the guy asked. Oh yes, the cops said politely, feel free to call us. Everyone went back to their lattes. I didn't experience what the man was talking about until a weekend afternoon about a month later, when gunshots sounded outside our window. They were loud enough that I actually dove from the couch to the floor. A police car sped by shortly afterward, but nothing else came of it, that we know of. Pretty soon, it was back to joggers and couples on walks. Off to the northeast (top photo), we can glimpse the Bay and AT&T Stadium -- we had a nice view of the fireworks when Bonds hit his record-breaking homer this week. On the south side of the house is a concrete water treatment plant surrounded by a wall of lumpy, netting-covered earth. On the west side, there is a brand new modern home going up and another glimpse of a view (bottom photo) of the city. And to the north, right next door? You're looking at it, at left. That's the view of our next-door neighbor's yard. The people who live there have been quite friendly, on the few occasions we've crossed paths. One afternoon, as we were standing at our door watching the cat explore his new outside territory, an elderly woman with missing teeth emerged from the screened-in porch. "You have a cat?" she said. "I wouldn't want the dog to get at him... I came here to give my grandson money to clean this mess up." 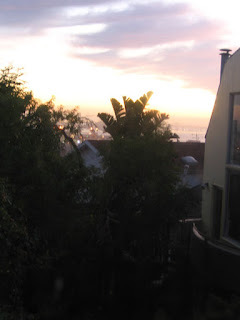 She waved her hand across the yard, and we nodded vigorously. "It's especially not good for me. It's hard for me to get around," she said. We introduced ourselves and she went back inside the porch. Later, we found out that the dog she mentioned had killed the previous tenant's cat. It was, we were told by our downstairs neighbor, "an ugly scene." 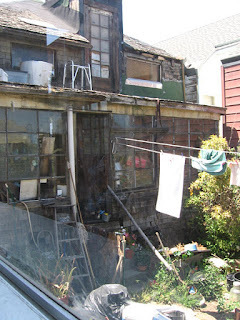 Despite the grandmother's intentions, the place remains as hazardous-looking as ever. I get a perverse pleasure from staring out the window at it, imagining what the inside must be like and projecting the reaction of the city officials who surely one day will have to inspect and condemn it. They'll walk through with flashlights and face masks, making world-weary jokes a la Law and Order: "Hey Murphy, got a trashcan?" or "Sheez, maybe the maid quit." The older man who lives there kindly directed us to our place on Carolina Street when we went to see it for the first time. "Sorry to be blocking the sidewalk!" he and his pal said cheerfully, presiding over a pile of junk that perhaps had tried to escape from his house. Our future home didn't look much better than his, at first: It was under renovation and completely in shambles, full of the tenant's poorly chosen stuff. The exterior remains nothing to write home about, the bathroom looks like it belongs in an elementary school and the kitchen counter is topped with a marbled perwinkle blue plastic that looks like it was installed at least 40 years ago. Still, inexplicably, I became obsessed with getting in here. I had dreams about it, lost sleep waking up at 4:30 in the morning thinking about it. I drove by during the day, stalking it, both before and after we signed the lease. (Incidentally, have you ever had a song creep in on you and haunt you along with an idea, absolutely defining a moment in your life? For me, the song here was "Tel Que Tu Es".) The three weeks between seeing it and moving in seemed interminable. We danced around after moving in, feeling like kings: a washing machine with no coin slot! A little office! A yard with a grill! "It's a real place," we said, perhaps overly grateful after years of living in cramped urban apartments with almost no amenities. I found it remarkable that most people you pass on the street in this part of town actually smile and say "hello," instead of "Spare any change for a beer?" We're settled in, but living here still feels simultaneously like being on vacation and being in exile on a foreign planet. A whistling wind, along with views (just squint!) 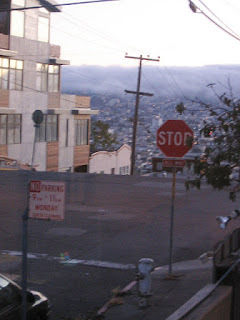 of the water and fog over the city, are punctuated by noise from the 53 bus line, the fire station, kids on their way to the neighborhood center down the street, hip-hop booming from beat-up cars, dressed-up old people on their way to Sunday church and white thirtysomethings walking their babies and dogs. It feels isolated, yet highly trafficked by a dozen intersecting microcosms. The fact that one of those microcosms is a fire station led our renter's insurance company to bump the premium down. Fortunately for us, gunshots and killer dogs probably don't merit an adjustment. i hope the nabe pans out for you two. maybe in a few years you'll be at the center of it all. wow, they gots lots of hills out in san francisco, huh? just keep your bed below the level of the window and be prepared to return fire if somebody shoots at you.